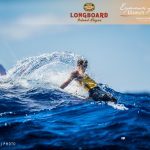 Known as foiling, elite athletes will compete for the first world title atop standup paddleboards equipped with hydrofoil technology, which could produce the fastest ever crossing of the famous Ka’iwi Channel at the Moloka’i-2-O’ahu Paddleboard World Championships on Sunday, July 29, 2018. 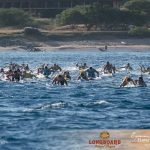 HONOLULU, HI (JUNE 21, 2018) – Organizers of the 22nd annual Moloka’i-2-O’ahu Paddleboard World Championships (M2O), presented by Kona Brewing Company today announce an elite group of standup paddleboard (SUP) athletes will compete for the coveted title on the latest and evolving hydrofoil technology in the sport. Once in the grip of the Ka’iwi Channel’s downwind, open-ocean swell, the foils will lift competitors’ boards from the water’s surface allowing athletes to harness the ocean’s continuous wave energy into a swift and fast 32-mile flight-like surf from the island of Moloka’i to O’ahu. 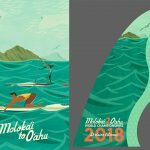 Race day is set for Sunday, July 29, 2018 when hundreds of international athletes will gather on the shores of Moloka’i to compete for the world title in the disciplines of prone paddleboarding and SUP. Visit Molokai2Oahu.com for more details. The gliding motion the foil racers will display is emblematic of the Malolo or flying fish seen along the course, which break the water’s surface to momentarily sail above the ocean to escape predators. However, if the conditions honor these athletes on race day, they could experience seamless foiling with minimal need to land their boards in preparation for the next wave-generated takeoff. The odds-on favorite in this year’s foil division is Maui’s Kai Lenny who holds M2O championships in both the men’s SUP stock and unlimited categories. 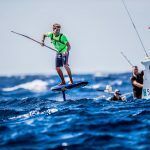 Lenny is at the forefront of pushing hydrofoil technology in the sport of SUP, a technology that was first seen in the surfing world, most notably attributed to big wave surfer Laird Hamilton. The elite field in this inaugural event will feature athletes that have mastered the foil technology and are conditioned to cross the channel solo. 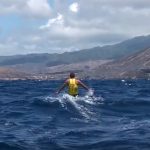 According to M2O’s race director Mike Takahashi the biggest challenges for these athletes will be experienced in the calm waters at the race start in Kepuhi Bay on Moloka’i and in the tumult caused by wave refraction near the race finish at Portlock on O’ahu. Should the Ka’iwi Channel serve up its hallmark windswept waves in mid-channel, the foil athletes could produce some of the fastest finish times in race history. On the contrary, if the channel indicates it may fall quiet as if did in 2015, these athletes will need to make a race-day decision to gamble on the foil or transition into the stock or unlimited SUP categories. Race fans can visit Molokai2Oahu.com and the event’s Facebook, Instagram and Twitter feeds for race updates from the Ka’iwi Channel. Each competitor and team can be tracked at Molokai2Oahu.com through DotVision satellite tracking once the race starts. Founded in 1997, M2O has grown from a grassroots challenge for the legendary lifeguards of O’ahu to the premiere event in the sport of paddleboarding. The race annually crowns world champions in the two disciplines of traditional (prone) and stand-up (SUP) paddleboarding. 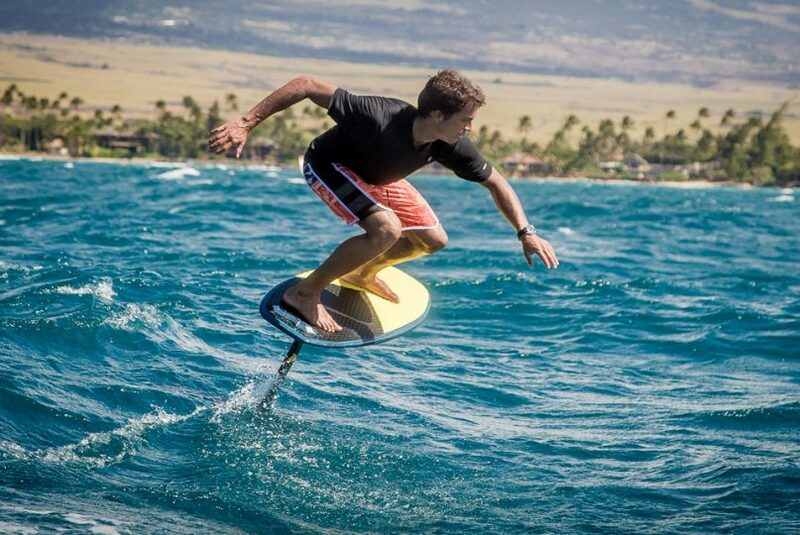 In 2018, a hydrofoil division was added to welcome the evolution of technology in the SUP. Connecting the islands of Moloka’i and O’ahu, the 32-mile race crosses the Ka’iwi Channel, also known as the Moloka’i Channel and Channel of Bones. Men and women from more than 20 countries will face strong currents as they navigate the fastest downwind-route over one of the most beautiful and powerful channels in the world. Top athletes can complete the crossing in less than five hours, riding mid-channel waves that crest more than 12 feet and carry paddlers hundreds of meters. M2O starts in Kepuhi Bay on the northwest shore of Moloka’i and finishes in Maunalua Bay on the southeast shore of O’ahu. The annual race is a deeply personal experience, challenging every paddlers’ physical and mental endurance. Every finisher experiences an individual championship. M2O is proudly supported by Kona Brewing Company, Hawai’i Tourism Authority, Duke’s Waikiki, Oakley, Patagonia, Rogue, Futures, Blue Rush, Stand Up Paddle Magazine, Ocean Paddler, Dr. Danger, DotVison, Aqua Pro Fitness, XO Activewear, and Fin Film Company.